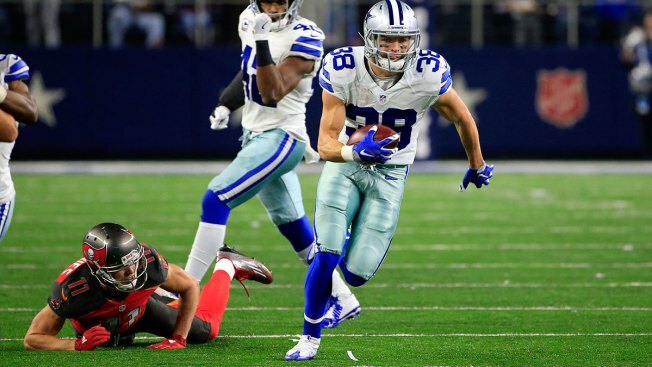 Dallas Cowboys strong safety Jeff Heath (38) runs back an intercepted pass intended for Tampa Bay Buccaneers' Adam Humphries (11) in the second half of an NFL football game, Sunday, Dec. 18, 2016, in Arlington, Texas. Ezekiel Elliott celebrated a short touchdown run by jumping into an oversized Salvation Army red kettle and the Dallas Cowboys closed in on home-field advantage in the playoffs with a 26-20 victory over the Tampa Bay Buccaneers on Sunday night. Tampa Bay (9-5) had its five-game winning streak snapped and fell a game behind Atlanta in the NFC South. Dallas stayed two games ahead of the New York Giants in the NFC East and needs a win without any help to clinch the home field throughout the NFC playoffs. 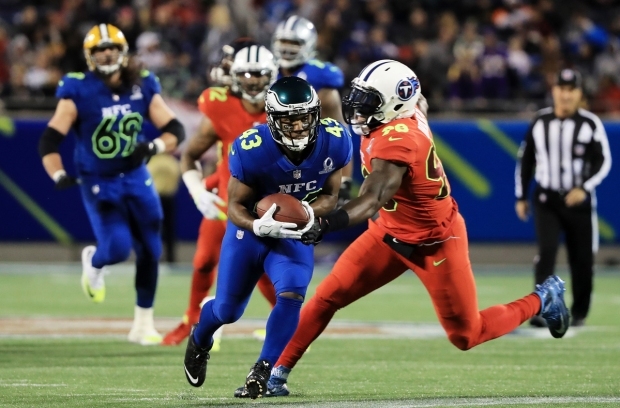 Elliott, the NFL's rushing leader, had a career-high 159 yards, including a 42-yard run to set up Bailey's fourth field goal for the six-point lead. Fellow rookie Dak Prescott bounced back from his worst game as a pro, going 32 of 36 for 279 yards a week after completing less than 50 percent of his passes in a 10-7 loss to the New York Giants. Elliott had NFL career rushing leader and former Dallas star Emmitt Smith and plenty of other people laughing when he jumped into the kettle and disappeared when he crouched down following a 2-yard touchdown in the second quarter. He drew a 15-yard penalty. Winston had scoring passes of 42 yards to Adam Humphries and 10 yards to Cameron Brate to put Tampa Bay up 20-17, but couldn't move the Bucs once the Cowboys regained the lead. Witten is one of two NFL tight ends with at least 1,000 catches and 10,000 yards receiving. Tony Gonzalez is the other. Owens spent three of his 15 seasons with the Cowboys.